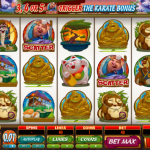 Karate Pig is a video slot game from Microgaming with a perfect blend of animals, martial arts and oriental culture. It sounds like an unusual mix of things that do not match, but once you open the game you will understand why is it so, it is funny, fast paced and offers once in a lifetime experience. Ok, so you are probably wondering what is so special with this game. We will tell you for sure, it is the bonus department where this game shows its true colors. 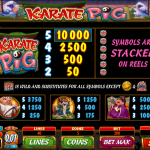 First we have a Karate Pig wild, which substitutes for every other symbol in this game except for the scatter ad the bonus symbol. And on top of that they appear stacked on the reels. Then we have the gold coin scatter symbol which appears only on the first and the fifth reel and awards you with 15 free spins. All the wins are doubled during the feature and it is also possible to retrigger the free spins. And last but not the least we have the Karate Bonus where you need to earn 7 karate belts so you can play the ultimate fight. Your current belt appears on the top left corner of the reels. There are 3 mini games you have to play here, Pork Chops Bonus, hammer Bonus and Final Showdown. 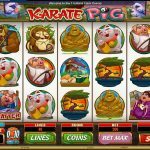 Karate Pig is unusually good video slot game from Microgaming. At first look it does not seem like that, maybe it is because of the symbols so we did not take the game serious, and it is. This is one heck of a slot with lots to offer. The best part are the features of course, where we have all the usual ones like free spins and stacked wilds but also some mini games too. There are some games worth trying just for their name. Kings Of Cash a 5 reel slot by MicroGaming is exactly that.